One powerful music writing application. I have been using the free Power Tab guitar tablature software for many years now. It’s a pretty good piece of free software, but it does have it’s bugs. I hasn’t seen any development for many years either. I had been quite curious about Guitar Pro, and it’s RSE2 sound banks. 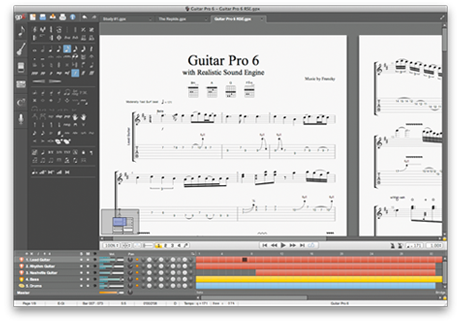 Thanks to Shelley at eMedia Music, I received a copy of Guitar Pro 6 to review. I have only scratched the surface of Guitar Pro’s powerful functionality in this review, but I believe it will give any potential buyers an idea of what they can do with it. Guitar Pro is fairly easy to use straight out of the box. You have musical notation, and guitar tablature line to work with on the page, and musical notation options on the left hand side. All you have to do is move the cursor on the notation page with your arrow keys to the string you want to be on, and enter a number representing the fret you want the note to be on. You can select the type of note you want (for instance, whole, half, quarter, etc note) from the tool pane on the left hand side. All of the standard musical symbols are available hear to set tempo, treble or bass staff, repeating options, codas, etc. This tool pane also gives you all of the symbols to note guitar specific techniques like slides, hammer-ons and pull-offs, palm mutes, tremolo picking, and more. You can select chord shapes, and tab them out automatically, write musical notes and directions. You can make multiple instrument lines in your music too. Whether it be multiple guitars, bass, drums, even piano/keyboard, orchestral instruments, all of it can be done by Guitar Pro 6, and more. It is quite easy to write up your piece of music using all of these tools using your mouse and keyboard. I found a few things a little awkward to do at first, but I think that this might have just been to do with my time using Power Tab, and Guitar Pro just did things a little differently. Once you’ve started to get some music written up you might want to take a listen to it. Click the play button and you will be greeted by the sound of your music playing right in front of you. This is where the next part of Guitar Pro gets interesting. Guitar Pro 6 comes with a really awesome sound bank system called the “Realistic Sound Engine” (RSE). The RSE gives you the power to set up your instruments to sound pretty much exactly the way you would want them to sound played through guitars, amps, and effects, etc. There are a range of amplifier and effects modules, plus studio processing modules as well. You can dial them in just like you would a real amp or stomp box, and whilst the sounds are still a little synthesized they make a great tool emulating the sound you may want to someone. Guitar Pro 6 is also configured with a whole range of “signature sounds”, so if you are having a bit of difficulty dialing your own sounds in you can select from these presets. Once you have finished your piece of music you can export the tabs as PDFs for distribution, and export sound files of the music in formats such as MIDI and Wave files. With all of this power at my fingertips I have been able to write up songs that my band has written, tabbing out all parts (including drums) for the members to practice, and also give them a basic demo to listen to and practice against. Guitar Pro has saved me a lot of time due the fact that I didn’t have to sit down and record the demos as well. Sure the demos definitely aren’t something I’d be distributing to try and get gigs, but they are incredibly useful for the band members. Overall I think Guitar Pro 6 is an amazing tool that any musician should have on their computer. It’s available for Windows, Mac OS, Linux, and iOS (iPhone, iPad, etc) so really anyone will be able to use it. 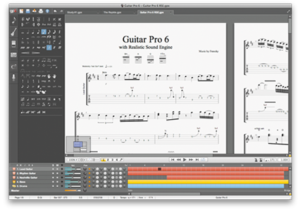 If you are interested merely in playing back tab files from the Internet, or you want to have all the power to compose music at your fingertips Guitar Pro is a must have application. 2 Responses to "Guitar Pro 6 – review"
I’ve been thinking about upgrading to this from version 5, so I’m glad you did this review! With Guitar Pro 5, I have struggled with a few things. First, it likes to crash a lot when playing complex/layered parts with the RSE. Second, when exporting to .wav, it likes to skip every once in a while, rendering the track useless for letting my drummer practice to. I hope they were fixed with the newest verison! Guess I’ll have to see. It’s a great piece if software. I’ve had no issues with my exported wavs so far, so I think you’ll be happy with it.